This small unifacial flake tool was discovered sometime during the 1953-1966 excavation of the Kalambo Falls site by J. Desmond Clark. It was found in the lowest archaeological sequence of the site within the Acheulean horizon. The tools found in this early level date to between 200,00 and 400,000 years ago. Although no bone material was found, it's believed they were made by an archaic form of Homo sapiens living at that time. This simple tool was made from a small flake that was struck from a larger piece of chert. The bulb-of-percussion can clearly be seen on the ventral (lower or smooth flake side) side. The edges of this flake tool may have been used for multiple tasks such as scraping or cutting. The edge illustrated in the picture above shows step fracturing that could have been caused by either shaping the edge during manufacture, later retouching the edge for resharpening or from use wear. This tool was made from good quality chert and it measures 1 3/4 inches (4.4 cm) long. 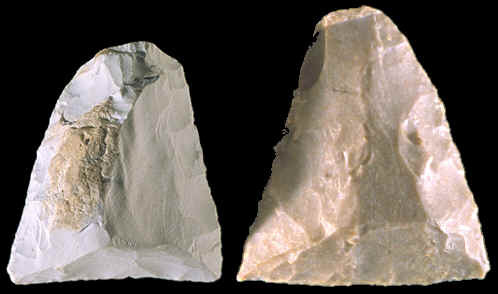 The simple flake tools illustrated above are remarkably similar, but in age, they are separated by at least 200,000 years. Both of these tools were made in a similar way and both of them may have been used for cutting and scraping. The main difference between the two however, is that the scraper on the right (a Clear Fork gouge) had evolved into a highly developed style that would have been hafted onto a handle. Its shape and outline was reproduced within very strict guidelines. But in contrast, Acheulean flake tools didn't need to be hafted and were not finished into such precise patterns. Their flake tools can vary quite a bit in shape and outline. The Kalambo Falls site is an open air site located in northeastern Zambia along the Kalambo River and not far from the Kalambo Falls & Lake Tanganyika. This site is known for its well defined stratified layers of occupation beginning with Acheulean on the bottom and Iron Age horizons near the surface. In fact, this site has one of the longest continuous archaeological sequences of occupation known anywhere else in the world. The Acheulean level is dated to between 200,000 and 400,000 years ago. The artifacts that were found in the Acheulean horizon at Kalambo Falls are remarkable for their quality of workmanship. "Rarely does one see a higher standard of Acheulean craftsmanship than at Kalambo Falls" (1994 Schick & Toth). 1972, Howard, Calvin, "A Study of the Clear Fork Gouge", pp.51-59. 1988, "Encyclopedia of Human Evolution & Prehistory," by Ian Tattersall, Eric Delson & John Van Couvering, page 294. 1994, Schick, Kathy D. & Toth, Nicholas, "Making Silent Stones Speak", "An African Later Acheulean Example: Kalambo Falls, Zambia", pp.264-268. 1994, Debenath, Andre & Dibble, Harold L., "Handbook of Paleolithic Typology, Vol. One, Lower and Middle Paleolithic of Europe", page 70. Personal communications with Nick Toth.